One of job that I proud of. 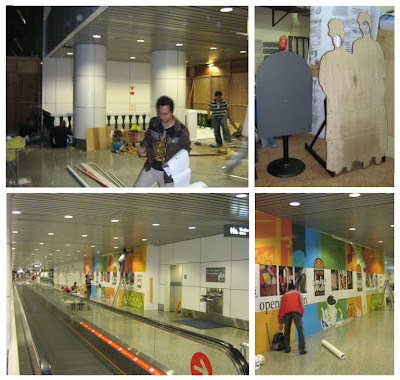 The whole total branding for client from Malacca that will open up a cafe corner at Wing B, Contact Pier Domestic, KLIA called JonkerWalk Kopitiam. I was really excited about the whole process. 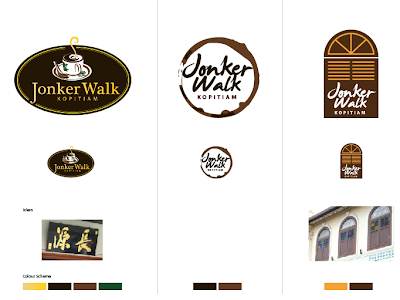 I already can imagine the direction of the design when the owner told me the name of the cafe is JonkerWalk Kopitiam. 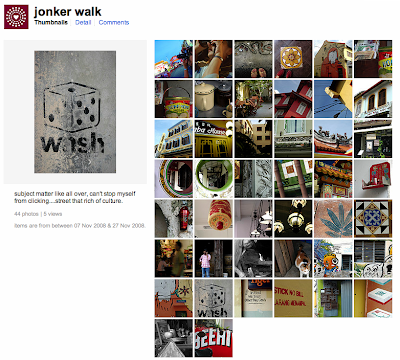 I love Jonker Street... The street where I used to spent my weekends brought along my kid to experience the culture. 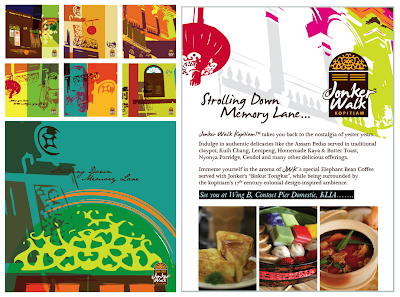 Jonker Walk is well known as a street with a row of antiques stores & cafes. 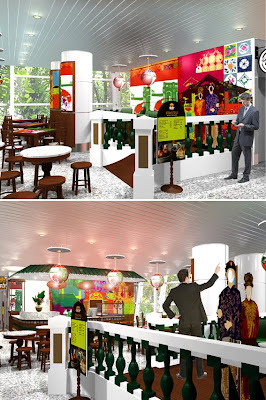 The whole scenario is so rich in culture from the past, with combination of architecture and foods. The option of logo proposal was submitted with logo application on interior, uniform etc. I proposed the use of vibrant colour illustration and photography as supporting visual. By looking at every corner of the cafe I hope the customer can found bit and pieces of elements adapted from the street. 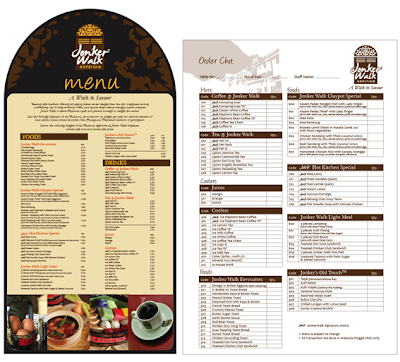 With budget constraint and deadline this piece of art & design is something that I am quite happy and really proud of. Client picked the window logo, it was rationalised based on window to welcoming visitors to the cafe, as a vital and precious architecture element found at Jonker Walk. Script font was chosen to give a feeling of casualness and friendly ambience. Used of golden and brown color is to reflect olden look, strolling down memorylane. Further enhancement made on window proposal but the result was essential. 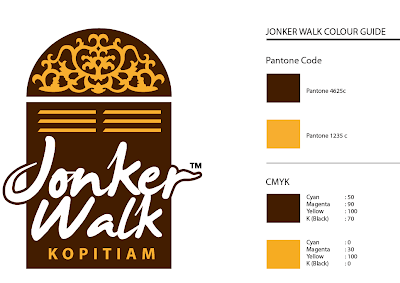 Some of other window proposal based on original architecture at Jonker Walk. Trip to Jonker Street Malacca - 2 days 1 night. We went on Friday so we could capture the Pasar Malam and night scene. We also need to do a food photo shoot, images to be featured on Table Menu Design, Pillar etc. We stayed at Baba Nyonya House, favourite boutique hotel and the place was right inbetwen Jalan Tan Cheng Lock and Jonker Walk. I photographed the scene with help of my two designers K & Helmy. It was so fruitful awesome trip.